We get quite a few questions about Toll Free Numbers here at WhichVoIP so we created this article to help. The main intent of this article is to arm you with some background knowledge about toll free services and provide a cross section of provider solutions for different real world scenarios. Toll Free Numbers, often referred to as 1-800 numbers in the USA, are special telephone numbers that are free for the person or business calling the number. This is because the person or business being called pays for the connection and per minute fees. Toll Free Numbers were made popular by businesses mainly as it allowed them to expand nationally and allow their potential and actual customers (local or out of state) to call them at no charge. This was taken a step further with "vanity numbers", allowing a business to choose a specific number that spelt out a word related to their business. A classic example of this was 1-800-FLOWERS, which is a lot easier to remember than 1-800-356-9377! Each digit on your phone has letters associated with them, allowing the customer to easily call your number. As businesses embrace mobile technology, Toll Free Number usage has adapted to help keep the public connected to a business by allowing calls to be redirected to employee’s cell phones when on the go. This article is broken down into the following sections. Links are provided in the case you want to go straight to a particular section. A quick history lesson - find out about how it all started, where we are today, and the interestig stuff between. How Toll Free Numbers work - find out what happens when a person dials a 1-800 number. Vanity numbers - what are they and why they might be important to a business. Toll Free Number service providers - get the lowdown on some great options for different business scenarios. It wasn’t until the early 90’s that the Federal Communications Commission (FCC) opened up the whole Toll Free Numbers market. Prior to that if you wanted a Toll Free Number then you had to go through a phone company, like AT&T. In fact, it was AT&T that originally introduced the 1-800 Toll Free Number service in 1967, named their Inward Wide-Area Telephone Service (IN-WATS). This was before the introduction of computer technology so numbers were assigned based on location (the 7 digits that followed 800), so the system knew where to route the call. With the introduction of computing technology in the 80’s, phone networks started migrating towards using a database solution. This allowed Customer Records (CR’s) to be set up with instructions on how to route the dialed number. This was a stepping stone to the FCC ordering for "Number Portability", with the intention of opening up competition in this market (originally AT&T was the only provider). This started with the divestiture of AT&T in the mid-80’s (when local telephone companies provided this service) and was finally in place during 1993. Portability meant that the number was not associated with a provider anymore and a person or business could change providers and still keep their Toll Free Number. These changes have helped the growth of Toll Free Numbers, causing additional prefix numbers to be opened up due to the demand. Since the mid-90’s the additional numbers added include 1-888, 1-877, 1-866, and 1-855. Number management is the main function of the 800 Service Management System (SMS/800 - a centralized database). They are currently planning for release of the 1-844 (December 2013) and 1-833 numbering systems to cater for future growth. When a Toll Free Number is dialed the call is connected to a Service Switching Point (SSP), also known as a telephone exchange. When the SSP receives this call it knows it has to query a database known as the Service Control Point (SCP). The SCP is a real-time database that includes Customer Records (CR’s). These CR’s provide the appropriate information to the SSP on where to route the call based on rules assigned by the number owner. This process is required as Toll Free Numbers do not include any geographic information (i.e. area codes). Time of day routing: As the name suggests, rules can be set based on the time of day during which the call is placed. An example of this may be that calls after 6pm get routed to one destination and calls before 6pm get routed to another. This can help also with time zones across the USA. 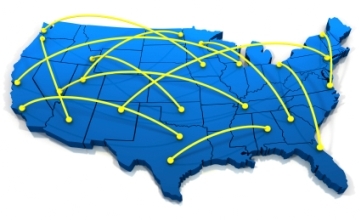 Calls could be routed to the east coast for early calls and the west coast for later calls. Day of week and day of year: One can set up rules based on what day of the week (e.g. week day or weekend) the call is placed or on what day of the year (e.g. public holidays, personal vacations etc.). Location: You can direct calls based on the callers location. An example of this might be if you have local call centers or offices that can take the calls in that locality, rather than an office in the opposite end of the country. Having an understanding of the local area may be an advantage. Others: Some others worth noting include percentage allocation, busy routing, and emergency and/or disaster routing. These rules can typically be set up through an online portal provided by the service provider. When looking for a service provider make sure you know what rules are important to you and make sure they are available. To get a Toll Free Number for yourself or business you need to contact a Responsible Organization (known as Resp Orgs). These are companies that provide Toll Free Number assignments, typically also the service provider. The Resp Org will go through the SMS/800 to find an available number to assign you. They will then do the relevant "paperwork" to provision the number for you and create the appropriate record to be sent to the SCP (to route the call appropriately when someone dials your new Toll Free Number). With vanity numbers the rule is generally to try and be creative. Think of something that makes you stand out from the crowd now that many of your competitors may have them also. Think of descriptive words also, like "best", "fast", "new" etc. Toll Free options are still popular even though that many phone services, like VoIP for example, include flat rate plans for unlimited calling anywhere in USA and Canada (the days of long distance charges are dying away with new technologies). There are typically a few options available with regards to payment schemes, a pay per minute option and a fixed rate per month option (that includes some amount of minutes). Which one you decide on will depend on your requirements. If you expect low call volume then you may want to consider the pay per minute type of plan. As volume grows a fixed monthly rate plan may make more sense and be more cost effective. As mentioned earlier a Resp Org is an entity that can provide you with Toll Free Numbers. There are currently around 420 listed with the SMS/800 (see full list). Here are some popular options compared in the below table, followed by more detailed information on provider plans available. All of these provider plans include the ability to manage your account online and they each allow for a no contract agreement (so you can use on a monthly basis without being locked into long term contracts). * - Phone service required from the provider for this feature to be used. 888, 877, 866, and 855 numbers: Monthly rates are $2 plus a one time setup fee of $2. 800 numbers: $5 monthly with a $5 setup fee. Vanity numbers: Start at $15 per month plus a one time setup fee equal to the monthly rate. Premium numbers: Start at $25 per month plus a one time setup fee equal to the monthly rate. National database search: This service is provided for $10. This is a great way to search for specific word or number combinations that you may want. The included features consist of voicemail and fax, web call button, virtual calling card, conferencing, call blocking, scheduled call forwarding, call notification emails, maximum call length, caller ID display and online management. Online management allows you to setup and add features, and update your "ring-to" number. Online tools are also available to generate call history reports, call analytics (great for ROI tracking), and ways to listen to voicemails and recorded calls. They also offer some neat enhanced services (additional costs) that include Interactive Voice Response (IVR) system, hunt groups, lead management, call recording, address lookup, payphone blocking and VoIP termination. Economy plan: $0 monthly fee, no minutes included. Starting at 5.9c per minute, depending on location (this rate covers USA 50 states, plus other countries like the UK, Taiwan, Malaysia, most of Mexico, Israel, Italy, Spain, Sweden, Ireland, India, Hong Kong, Germany, China, Canada, Australia, New Zealand and more). Deluxe plan: $9.95 monthly rate and includes 250 minutes. Additional per minute rates start at 4.9c. Premium plan: $19.95 monthly rate and includes 500 minutes. Additional per minute rates start at 3.9c. Gold plan: $29.95 monthly rate and includes 1,000 minutes. Additional per minute rates start at 2.9c. Platinum plan: $49.95 monthly rate and includes 2,000 minutes. Additional per minute rates start at 2.5c. There are no setup or activation fees, except for specific requested vanity numbers and 800 numbers, which both have a $30 fee. You can keep your existing number but there is a $15 porting fee. All plans include virtual fax service (via email), voicemail (voicemail to email plus custom greetings), and an auto attendant function (custom greetings and key press extensions). 800.com offer a 30 day money back guarantee and customer service hours between 8am and 9pm, Monday through Friday, and then 9am to 2pm on weekends (Central time). Grasshopper was started by 2 entrepreneurs in 2003 and targeted towards start ups and small businesses. Their website suggests that over 100,000 entrepreneurs have been served since 2003. All of the plans include unlimited extensions (1 digit numbers for departments and 3 digit numbers for employee extensions) and all features (such as call forwarding to mobile phones, voicemails and faxes via email, caller ID and online or phone account management). Pay as you grow plan: $12 per month and 6c per minute (no minutes included). Ramp plan: $24 per month and includes 500 free minutes. Grow plan: $49 per month and includes 2,000 free minutes, plus 2 Toll Free Numbers. Max plan: $199 per month and includes 10,000 free minutes and 3 Toll Free Numbers. Recorded greetings can be uploaded by you or created by their professional voice studio. All plans include a 30 day money back guarantee which always shows to us that they stand behind their service. They also note 24/7 live US support on their website and have a knowledgebase for common questions and support. Vonage Business Solutions are a hosted VoIP service provider for businesses from small to large. As an add-on feature they offer a Toll Free Number service. The cost is currently a flat rate of $39.99 per month. This includes all your calls to this number (so no per minute charges). This is a great choice if you are considering switching your phone service to VoIP or you currently use them. Another hosted VoIP provider for businesses. Rather than the monthly flat rate plan they offer this service for 2.5c per minute if you already use their business VoIP service. This is a great rate and good option if you expect a low calling volume. 100 minutes plan: Starting at $8.95 per month with overage charges of 4.5c. A great option for low volume of calls. 500 minutes plan: $19.95 per month with overage charges of 4.5c. A great choice for medium call volume. Unlimited minutes plan: $69.95 per month with unlimited minutes so no overage charges. A good option for large call volumes. The Nextiva Connect plans include free setup and no contracts are required. The cost of the number is included in the monthly fees and you can set up your calls to be routed anywhere. Some neat features include an auto-attendant and a dial-by-name directory that allows the user to dial a persons last name to get connected. Overall a great option for low to high calling volume needs. Standard plan: This plan includes 1,000 free minutes. Premier plan: This plan includes 2,500 free minutes. Enterprise plan: This plan includes unlimited minutes. Any overage is charged at a rate of 3.9c per minute. This is another great low cost option if you are looking to switch to a VoIP solution for your business. Pro plan: This plan is from $8.29 per month and includes 300 toll-free minutes and 2 extensions. Overage charges are 4.9c per minute. ProPlus plan: This plan starts at $16.29 per month and includes 1,000 free minutes, 5 extensions, and a dedicated fax number. You also get the dial-by-name directory feature included. Going over the included minutes will cost you 4.4c per minute. ProBusiness plan: Starting at $23.29 this plan includes 1,000 minutes, 10 extensions, dedicated fax number and the dial-by-name directory feature. Overage charges are 4.2c per minute. All plans include their Internet fax service as well as a boat load of neat features, such as call recording, auto-receptionist, call forwarding and screening, click to call buttons, music on hold and much more. They also include a mobile app so you can manage your service on the go. These are really good options for low to mid calling volume and if you want all the additional associated features. There are over 420 Resp Orgs out there that can assign and set up a number for you and provide you service. There are various options and plans available, including VoIP based plans (for the complete phone system set up), monthly flat rate plans with X number of minutes included, or simple pay as you go options with no or low monthly fees and per minute charges. There are also various pre-fixes available now, including 1-800, 1-888, 1-877, 1-866, 1-855 and 1-844 will be available soon. Vanity numbers can be a great asset to your business making it easy for people to remember your number and understand what your product/service is. A Toll Free Number gives your company, whatever the size, credibility and a professional look and feel. If you are considering switching to a VoIP based solution then we recommend you always ask what the Toll Free Number options are if it is something that you require or think you might need later. As shown above, different providers have slightly dfferent options so you need to consider what works best for your business.